Mary has found her blankie, but we still have a mailing list of people looking for this blankie. This is my son’s favorite lovie. He has had it since before he was born. He was in the NICU for a month when he was born and Blue Baby stayed with him and covered him in the hospital. My son has Down’s Syndrome and sensitivity issues. Blue is the one thing that calms him down when he is out of control or needs soothing, and he is 6 now. 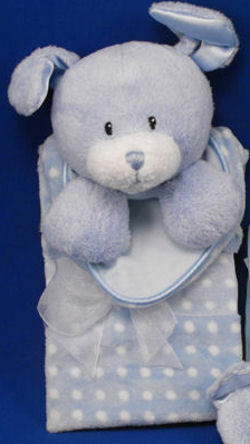 We thought Blue Baby was put up safe, but he was attacked by a real dog and his face, ears, paws, and blankie were ripped and shredded. We told our son that Blue is at the doctor getting fixed to buy some time, but we didn’t find all the pieces to piece Blue back together. This happened on Sunday, February 27, and he is having trouble sleeping, because Blue Baby is so sick. So now I don’t know what to do. Blue has been a miracle worker with our son, and we need new one quick. We have this Doggy brand new with tags – just got it in. We are selling him for $14.99 and I can send him to you for $20 including shipping. I am also looking for a replacement for my son who just left his dottie dots dog blanket on the airplane home from vacation! He is so sad!!! I will buy one from you ASAP!!! I’m also looking for this blanket. If you know where I can get one, please let me know! My son is 7 and has had his since birth, and it has gone missing…he is very upset…I have gone to specialty stores with no luck. The new design will not do. He tells me it is not “baby”, if anyone knows where I can purchase one, no two, so I can have a backup…thank you. We are in the same situation. ” Old Baby” got lost at pre school. I have turned the place upside down. We posted a” have you seen me’ sign. No luck. I will try a reward next week we desperate. Going through a divorce and Old Baby is his best friend!!! If you can help us please let me know!!! Kathi – do you still have these for sale? If so can u post/email me details please? I’m in Canada. If you have one let me know.